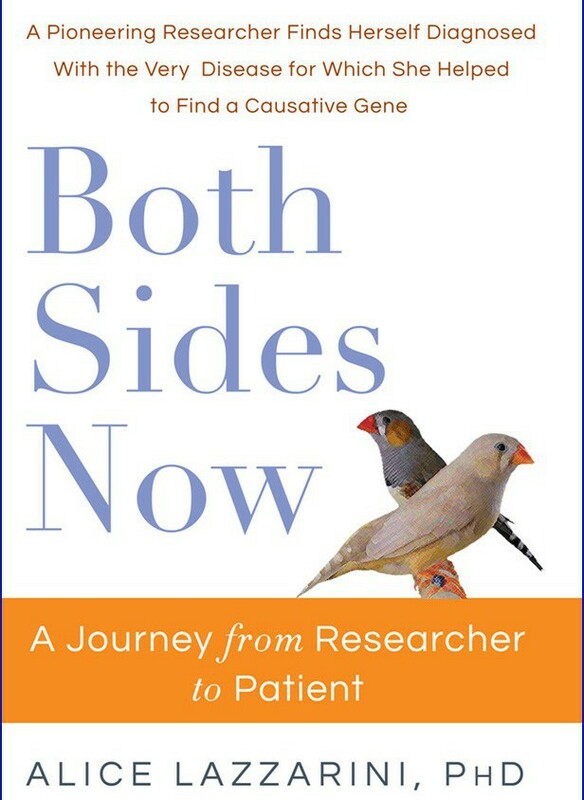 People ask why I have a picture of two overlapping zebra finches on the front cover of my book, Both Sides Now, A Journey From Researcher to Patient. I explain how terrified I have always been of birds, and how their role in providing researchers with an understanding of the pathways involved in Parkinson disease has changed my relationship with these tiny creatures. These male and female finches looking in opposite directions (Courtesy of the laboratory of Dr. Erich Jarvis at Duke) spoke to me of having seen Parkinson’s while looking from both sides of the white coat. In those 20 years, we’ve come a long way, with the Michael J. Fox Foundation now calling alpha-synuclein “the most promising target for a disease modifying therapy.” Millions of research dollars having gone into clarifying why it clumps into the Lewy bodies found in everyone with PD and into exploring different ways that we might counteract its detrimental effect. “I’d like to see a mutated alpha-synuclein gene inserted into a songbird,” I quipped to Dr. Jarvis, trying to envision what the results might be. I thought I had posed an impossible problem, as I couldn’t imagine the process of inserting a foreign gene into an embryo that had a protective eggshell. Now, researchers in Dr. Nottebohm’s lab report successfully inserting a disease gene into songbird eggs. “Finches provide clues for Huntington’s disease” read the headline from Medical News Today referring to a study published online 5 October 2015 (doi:10:10.1038/nn.4133) in which Liu et. al. created birds with both a motor and vocal disorder. A transgenic Parkinson disease bird should soon offer yet another tool for our development of therapeutic strategies.